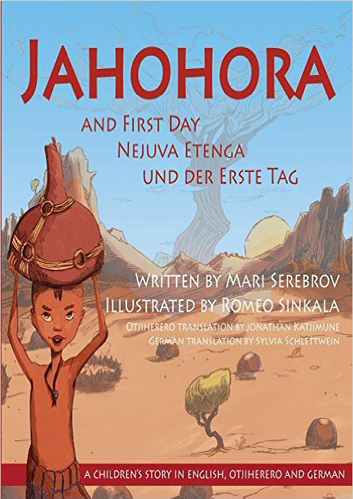 A tale within a tale, Jahohora and First Day retells the Herero creation story in English, German and Otjiherero. The first in a series of children’s books taken from the childhood scenes in Mari Serebrov’s historical novel Mama Namibia, it celebrates traditional Herero culture and family. Namibian artist Romeo Sinkala brings life to the words through his desert landscapes and depictions of all creation emerging from the sacred omumborombonga tree.